Officially licensed replica from The Hobbit series. This highly detailed replica from The Hobbit was constructed to match the actual filming prop exactly. 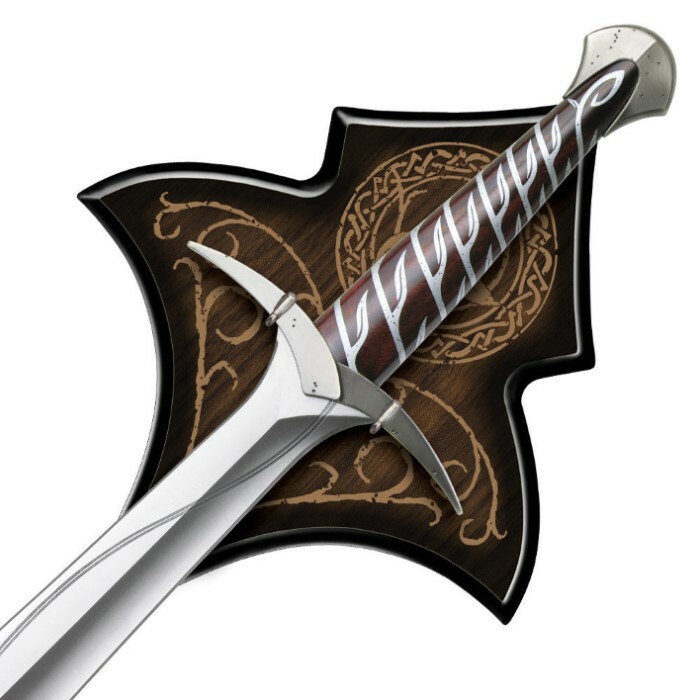 Known as Sting, Bilbo Baggins' sword features a 15-3/8" stainless steel blade, solid metal hilt parts and an intricately detailed vine motif on the handle. It includes a wooden wall mount display plaque to showcase it in dramatic fashion. 22-1/2" overall length. My son Isaac bought this along with the scabbard. I have to say that I was very impressed. This is a sharp and well balanced little sword and looks great. I would have preferred a wrapped handle but the quality of the blade and fit and finish make up for that by far. The best thing about this is that when you do strike with it the blade will actually ring like a bell. I havent seen that before. All in all, a good buy for sure. Best looking Blade I own! This is the perfect sting replica, it feels nice in your hand feels amazing to hold! The blade shines in the light like the moon!this is a very nice sword I definitely would recommend it to any one who likes Lord of the Rings/The hobbit or just likes beautiful swords in general.11/10! Wonderful replica. 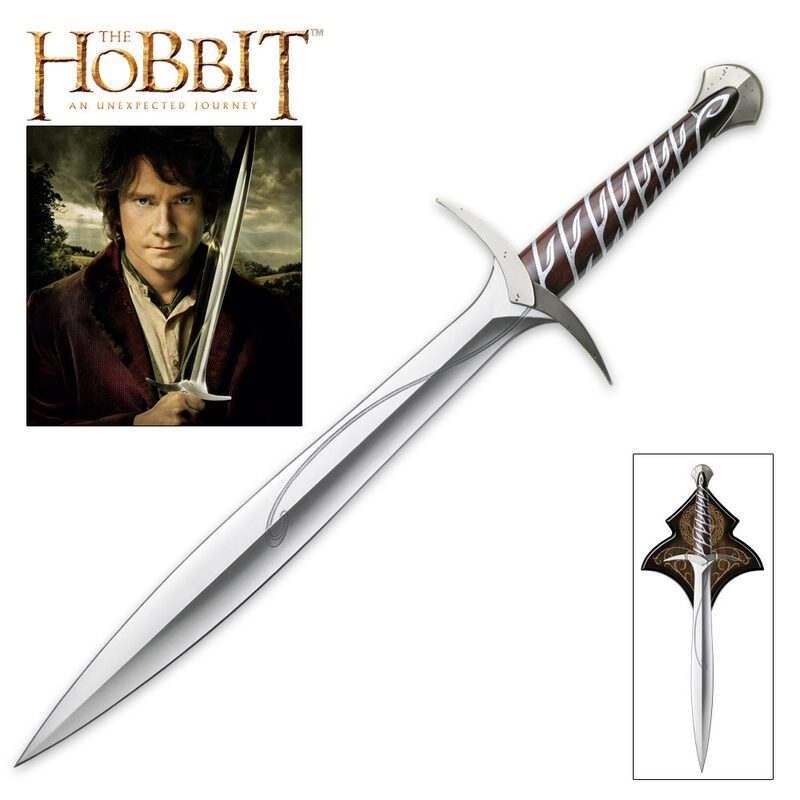 I actually prefer this one to the Frodo edition, because the blade is shinier and the carvings are much more subtle. Sting is probably the most iconic sword in the whole Tolkien saga and this piece does it full justice. Now this is what Sting is supposed to be-the Lord of the Rings Sting was not as good. This sword is made beautifully & razor sharp-a big plus! This sword is really epic the Hobbit is my favourte movie and Bilbo is my favourite character from the movie im getting this sword for my birthday! Very Nice! The quality of the sword is simply outstanding. Well worth the price and a great addition to not only a Hobbit/LoTR collection, but to any sword collection! Besides, how can you have a Hobbit/LoTR collection without Sting? FIRST piece to my daughter's collection. I was sure the quality would be impressive since I have Anduril, and I was so right. But this came with a razor sharp blade, which made it all the more impressive, not to mention the design, script,woodwork,and my daughter enjoyed stabbing all the Christmas boxes with it, which it neatly pierced. Due to there being so few Orcs in South Carolina, we haven't been able to witness the blue glow, but we're hopeful. Fun, beautiful and at a wonderful price for what you get. Worth saving for any of the LOR weapons. Glambdring is my next purchase. Bilbo Baggins: I have... I have never used a sword in my life. Gandalf: And I hope you never have to. But if you do, remember this: true courage is about knowing not when to take a life, but when to spare one. This sword is everything I wanted it to be and MORE. It exceeds all of my expectations. This United Cutlery: UC2892 Sting Sword of Bilbo Baggins. I note that because UC made a version for the LOTR movies that is different. The Frodo Baggins Sting has elvish engraving on it... 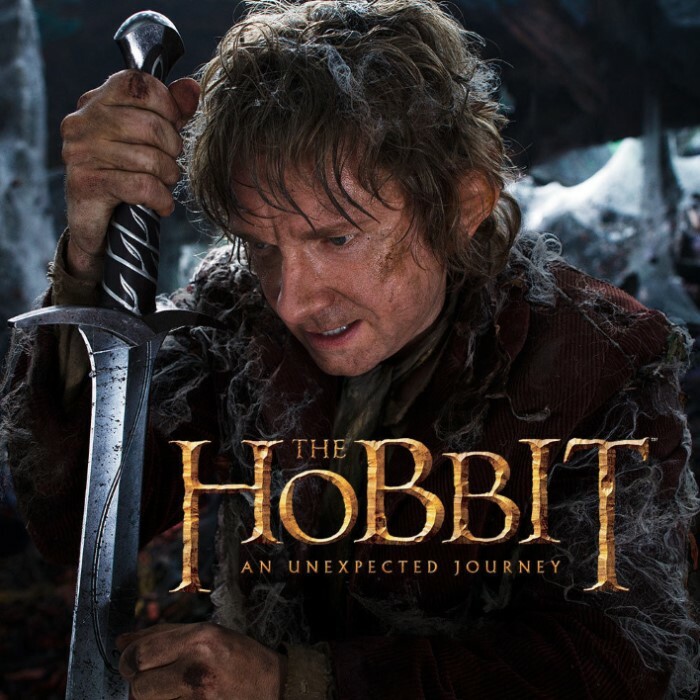 I assume the Elves of Rivendell modified the blade after Bilbo came back from the Dragon adventure. The blade is as solid as the come, LOTS of care went into the design and it's remarkable. You absolutely MUST purchase the scabbard. You can hang both the sword inside the scabbard, which is great! It has a locking mechanism when you slide the sword into the scabbard and makes a great sound when you take it out. This is perfect! I highly recommend you buying them. You won't be disappointed!